Student associations in particular began to encourage the censorship movement on April 6, 1933, a month before the burnings, when the Nazi German Student Association’s Main office for Press and Propaganda proposed “Action against the Un-German Spirit.” This officially announced student support for destruction of literature. Two days later, on April 8th, a preliminary document of “twelve theses” was created by a student association. The theses “attacked ‘Jewish intellectualism,’ asserted the need to ‘purify’ the German language and literature, and demanded that universities be centers of German nationalism.” This document was published on April 12th, preceding the book burnings that would occur in the next month. On May 10th, 1933, more than 25,000 books went up in flames when students organized gatherings to destroy what they deemed to be blemishes on German culture. A change occurred within communities; author Fernando Báez writes, “A kind of fervor . . . took control of students and intellectuals.” Students “marched in torchlight parades” through streets in organized masses to announce that they were “against the un-German spirit.” Approval of a “blacklist” of books was unofficial, but when it was publicized, government ministries supported the initiative the students had undertaken. The burnings were held “with great ceremony” and crowds gathered to watch and support. Though students led these gatherings, there were often appearances by Nazi officers and university faculty or administration. The students brought together many books written by the best authors of the early twentieth-century and “mercilessly burned” them. Erich Kastner, an author who witnessed this and had already been censored, wrote, “I stood in front of the university, wedged between students in SA uniforms, in the prime of their lives, and saw our books flying into the quivering flames. . . . 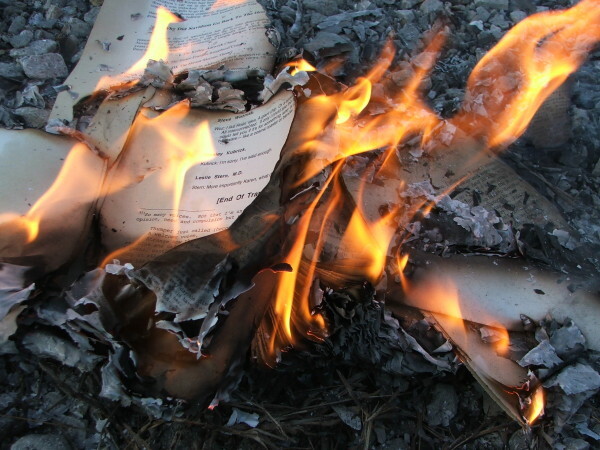 It was disgusting.” The attempt to destroy all “un-German” literature resulted in copies of works by various influential authors being destroyed, including Bertolt Brecht, Ernest Hemingway, Jack London, Heinrich Heine, Franz Werfel, and Karl Marx. Historian Marc Lüpke notes that in addition to authors, other intellects bent to the actions of the Nazis and students: “Library employees and many professors went along with the emptying of their collections, even if they didn’t all agree with it.” And the pressure from government and a dedicated element of society–specifically students–pushed the movement forward. Authors who were no longer allowed to be published within German borders were also pressured to emigrate. As a result, May of 1933 was the start of a “mass exodus” of authors and thinkers. As student associations became the leaders in the movement to destroy “un-German” culture, members of German society did not take the burnings seriously; they disregarded these events as a “student lark” even though the students had begun to organize themselves and plan attacks before May 10th, the actual burning date. In Berlin, on May 6th, students arrived at the Institut für Sexualwissenschaft, a private sexology research institute, and spent three hours ransacking the building. They vandalized the furniture, carpeting, wall decorations, and simply destroyed anything and everything they found. “They confiscated books, periodicals, photographs, anatomical models, a famous wall tapestry, and a bust of Hirschfeld,” all of which were burned in the fires. Historian Leonidas Hill writes about this event and the lack of reaction, noting, “There was virtually no resistance to any of those actions from the university authorities and faculties, the students, the libraries, or the bookstores of publishers.” Competition between student associations and university organizations played a major part in the student leadership that took place. For example, the event at the sexology research institution was planned and executed by Deutsche Studentenschaft, a Nazi student organization, which aimed to “upstage” another Nazi student organization, the Nationalsozialistische Deutsche Studentenbund. The Holocaust describes the systematic annihilation of millions of Jews by the Nazis during World War II. But that event was preceded by the Bibliocaust, in which millions of books were destroyed by Hitler’s party. The destruction of books in 1933 was the prologue to the slaughter that followed. The bonfires of books inspired the crematory ovens. Sara Gannon is a junior at Clayton A. Bouton High School. She is the poetry editor for the Blackbird Review and a class officer of the Class of 2017. She enjoys reading and writing in her spare time.